Tens of thousands of patients have been ordered to stop taking a popular fat-busting drug suspected of raising the risk of heart attacks and stroke. The European Medicines Agency last night suspended the licence of the drug Reductil, which was taken by 86,000 Britons last year. The safety watchdog fears it could threaten the health of the overweight and obese - although it says any side-effects should not be fatal. However, some 17 deaths have been linked to the drug in Britain since 2001 - six of which were caused by heart attacks and strokes. 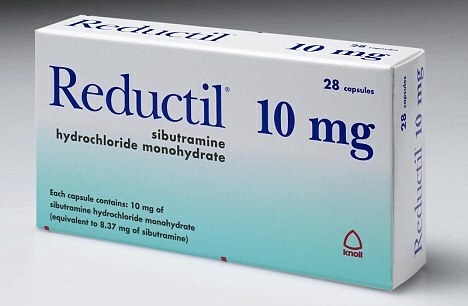 Some 1,105 suspected adverse reactions have been reported, a third of them serious.Last night doctors and pharmacists were told to stop handing out Reductil. And experts urged everyone who takes it to make an appointment with their GP to discuss alternative ways of losing weight. It is the second popular antiobesity drug to have its licence suspended. Two years ago, the EMA suspended Acomplia over fears it could lead to suicidal thoughts. The agency came to its decision on Reductil after examining an international clinical trial, which showed that its main ingredient - sibutramine - increases the risk of heart problems. Sibutramine tricks patients' brains into making them feel full, meaning they eat up to 20 per cent less. Last night, Dr June Raine, of the UK Medicines and Healthcare Products Regulatory Agency, said: 'Evidence suggests that there is an increased risk of non-fatal heart attacks and strokes with this medicine that outweigh the benefits of weight loss, which is modest and may not be sustained in the long term after stopping treatment. The international trial examined by EMA followed 10,000 patients over six years. It found a 16 per cent increased risk of heart attack and stroke. Many of those who took part in the trial had cardiovascular problems - even though one of the listed side effects of the drug is that it can raise blood pressure. Labels: Say no to "Reductil"
nice blog man.. carry on..